Before we begin, let's get the obvious stuff out of the way: Even if we can prove that Mitt Romney cheated during the debate, we shouldn't forgive Obama's poor performance. On the other hand, the fact that Obama performed poorly does not mean that we should tolerate Mitt's cheating. Did he cheat? The photographic evidence seems undeniable. The evidence comes to us by way of this blogger, previously unknown to me. Her name is Deborah Newell Tornello. My more feminist-minded readers will probably give me The Usual Lecture if I mention that she is quite lovely, so I won't do that. The gist of her piece comes to this: The rules forbade Mitt Romney from bringing prepared notes, yet he appears to have done just that -- and quite brazenly, I might add. The notepad he placed atop the podium bears no resemblance to the few sheets of blank paper on which the candidates are allowed to make notes during the debate. 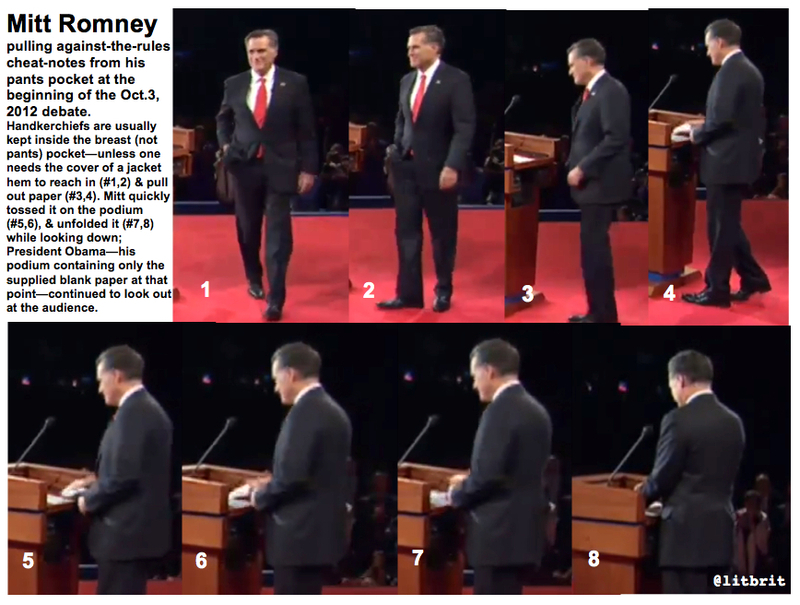 The above screen-grabs, which I hastily threw together last night after hearing about Romney's "cheat-sheets" from various people, are from the :08 second mark through approximately the :11 second mark. Watch the video from the beginning, and keep your eyes on Mitt Romney's right hand as they switch to the camera that's behind the podium, and he reaches into his pocket--retrieving what appears to me to be white note-cards or notebook as he pivots--and quickly tosses it onto the podium. (Both candidates are supplied with blank paper and pens, which you can see are already laid out on both podiums. Bringing in notes of any kind is prohibited by standard presidential debate rules, an example of which can be seen here, on page 4, 5c.) As I noted on the graphic above, handkerchiefs are normally kept in one of the breast pockets, near one's face; I imagine that Romney and/or his "debate-prep coach" deemed that to be too attention-getting (reaching into the breast pocket), knowing the cameras would be in front and back, and people would be looking at the candidates' faces at that point. So Romney smiled big, keeping the smile frozen on his face even as his back was turned away from the audience. "We need to get off this stage." Ms. Tornello -- if you are reading this -- I am jealous. You have made an enviably fine catch. When I made a similar catch (actually, my ladyfriend deserves the honors) in 2004, this humble blog suddenly received massive amounts of traffic. I hope that your site is now experiencing similar attention. Cannonfire readers, I urge you to hop on over to Ms. Tornello's site and thank her profusely. And please do whatever you can to publicize this story. Shall we make a big deal out of this? Oh yes. You know damned well that Team Red would not hesitate. Update: The mainstream media have already noted this story. The Romney campaign says that there was no cheat sheet -- just a "hanky." Oh really? That sure looks like a day planner in the frame capture above! And pay close attention to that CSPAN video of the end of the debate. It sure looks to me as though Mitt has placed his pre-prepared notes inside the blank sheets of paper that were "legal." Undeniably, Ann can't stop herself from gazing at them. That's a sure "tell." If there are any gifted lip-readers in the audience, I would like to see confirmation that she really does speak about the need to get off the stage. I've made some comments questioning the analysis of this video on the source blog, Litbrit in greater detail, but if you look at this cap of a 720p video you can see that the item crumples in the way you would expect a handkerchief to. I think you may be out on a limb here Joseph. It's a hanky. I'd like to believe Mittens cheated, I really would, but it's just a hanky. And even if the hanky was hiding something flat and covered with writing, so what? No one's mind will be changed. Several years ago, LitBrit had a tremendous series of posts about Sarah Palin's faked pregnancy. Then she seemed to stop posting for a long time, so I stopped checking her blog. I'm really glad to see that she's back in action. Beatitude Sputnik -- I like your nick. You're not of the Roland Park Sputniks, are you? At any rate, you need to look closely at the image I posted in my comparison. There are THREE white....things...on the podium. The original (blank) sheet of paper, a rectangle to its side, and something white above the paper, nearer to the mic. That "something white above the paper" may well be your hanky. We must concede that a hanky played a role here, since Mitt used one during the debate. I think he used that hanky to transport the notes, which are clearly visible, and which are clearly something other than the original blank sheet of paper. Besides, a gentleman does not leave his pocket square on the table. He keeps it in his pocket and takes it out as necessary -- UNLESS he was using that hanky to transport his notes to the podium. Ah, thank you for noting that I will check the video again and see if I can get a clearer shot of it. That is the heaviest handkerchief I have ever seen. He must have supersnot lodged in it because when it landed on the podium you could almost hear it go thump with the landing. I guess technically Romney isn't lying...he probably has the notepad wrapped up in the handkerchief. Yep---that's what you can expect---a sliver of truth wrapped around lie after lie after lie....but in the end-he's still one big ugly rag of snot. Joeseph I took a quick look at the video but didn't find that frame, but, that could easily be a piece of paper that he was finished with. I have to say I think that you might be making a mistake putting your credibility on the line with this. If I were you I would consider at least trying to find a higher resolution video and double checking. Anyways, love the blog, gotta run. "...but in the end-he's still one big ugly rag of snot." ps- I meant to add a few things-one being that I don't necessarily think this was a traditional notepad. Not very thick -or It could have also been index cards, because that was my first impression while the debate was going on. If I remember correctly, I seemed to think he was flipping through cards. Looking at the photo- it appears that the notes that he was writing were on the left and maybe on the right are index cards. I noticed at the end- it really didn't look like a notepad it looked like many sheets of paper. Does anyone know how much paper they are allowed at the podium? Are they given a couple of sheets- one sheet? It was definitely more than two sheets of paper. And- I also pride myself at being pretty good at lip reading- it's a private hobby of mine. I will mute the tv and put closed captioning on periodically. It's my pauper training in lip reading. So- yes I can confirm- Ann said- ..."we need to get off the stage. Wave goodbye to everybody." I couldn't catch the words right before -her face was moving around a little too much then. It's a handkerchief. He used it during the debate. It's hotter than hell under those lights. Obama probably had one, too. I am sick of these moronic bloggers who are trying to make names for themselves by peddling hoaxes. I love the way Romney flipped the paper onto the podium. Romney the Flipper? Yes, the body hand language regarding the way he flipped it seems to indicate it had notes on how to win the debate on it. I hear he got the debate winning recipe from the Soup Nazi's armoire after Elaine gave it Mitt. Although Rumor has it that it's actually his missing tax returns. As a joke the Romneys put the missing tax return on the table whenever they go to restaurants and such. It's an inside job, er inside joke. How come the internet community had no way to get word out to the people in the audience that Mitt had notes on his lecturn? Could you imagine Jim Lehrer asking Mitt about the notes on his lectern in the middle of the debate. As one of your longtime readers since 2005, isn't it interesting that you have so many posts (most of them anonymous)denying that Romney cheated and that he used a hanky instead? I'm glad you've been able to relocate and grow roots in your new home back East. Yes, Obama looks worried, he looked unsure of himself, he looked nervous, almost like the was scared or had been threatened. There were plenty of talking points he could have used against Romney like his 47% remark, but he avoided using them. kc, I will take your word on the subject of lipreading. I know that some people are remarkably gifted in that regard. Ok- this is my last comment on this. As he is tossing the alleged handkerchief on to the podium...there is a slight of hand where he appears to transfer something from his left hand to his write hand. Probably not much to go on there, but it was interesting to watch. And to anyone else who is watching this and doubting the handkerchief is up abobe the paper in the podium. There is one shot of the hankerchief sitting near the mic above the paper on the left. If you really care- look it up---think it is around 20:04. I don't know if this is conclusive evidence, because we can't say he didn't move the handkerchief at some point and that is why there is the other image. I also was intrigued by Romney's flag pin. It appeared to have a bullet hole in the flag or something??? Any guesses. And lastly to correct myself--Ann said--"We should get off the stage, Wave goodbye to everybody." I didn't read NEED in her lips. Okay-it's been fun,have a great holiday weekend. Anyways if he was cheating, he would have done it by writing down requests for information on his notepaper, scanning the notepaper with a camera in his lapel pin, and having an assistant give him the answers through an earpiece. I've looked at several videos now, and it seems the original toss of whatever it was onto the podium resulted in a flounce or bounce about what I'd think a handkerchief would do, not papers. However, there is bit of a thud as well, picked up by the mike, so I do not discount that the hankie could have been the conveyance of and the camouflage for some paper materials hidden within it. He didn't flip a handkerchief onto the podium lectern, unless the prior snots had all dried up. That was a folded up piece of paper he flipped onto his lectern and it should be discussed. He needs to say what was on it. However, whatever benefit can be derived from bringing notes is probably muted by looking down trying to find what one is looking for. Obama lost a lot of points for looking down too much. Do you think Romney stole Obama's notes and that was why Obama kept looking down so much? "There were just here a minute ago?" Beatitude Sputnik, that is clever. So maybe we need some airport security folks doing pat downs before the next debate, right at the lecterns. Never mind, apparently it is a special secret service lapel pin given to him by his detail. Ok - so Romney Camp says it was a simple hankie right? Maddow covered it partially then used it as a jumper to her "jobber" (think birther) segment without really examining all the available video and photos. Well, Mr. Romney (and others) - does THIS look like a simple hankie to YOU?! On that podium is NOT just the papers provided to the 2 candidates by the PDC and is not just a folded up handkerchief. So what is that item?? 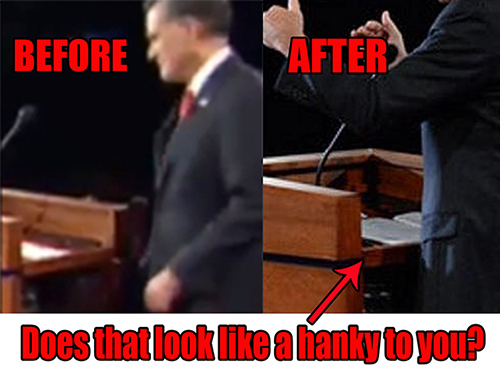 Has anyone looked thru the whole debate video to see if Romney pulls a hanky out of another pocket later on? If you do a little more research you will also find out that the group that host the debate is a company formed by the RNC and DNC and is not a neutral party. They meet with the candidates and/or their representatives and work out the how the debate will be conducted. This includes what can and can't be asked or discussed. So if in fact it is found out that he did have notes it is possible that it was agreed upon before hand. Some have brought up that GW Bush had a carefully concealed ear piece. Its all smoke and mirrors folks. It's interesting that Mittens puts something into his pocket at around 17 seconds into the video (looks like he is putting his handkerchief in his left-front pants' pocket). Why would he do that seconds after he so non-chalantly tosses his handkerchief on the podium? It would be interesting to see where he gets his handkerchief later when he wipes his face with it--does he pick it up from the podium or does he pull it from his pocket? He had to have a cheat sheet to help him keep track of his ever-changing policies! I wouldn't put it past the repukes--remember what Bush did in the 2004 debates--http://www.fair.org/index.php?page=2012? Good Lord Grasping at straws. How ridiculous, try instead commenting on the distortions the President claims on money numbers, Now that is real deceit, yet the Liberals keep Mum. You will know a tree by the fruit it bears. No mention of the serious cover-up for twenty days or so of the Killing of the Ambassador by Al Qaeda. That to Me is real deceit to the American public. A handkerchief is crib notes? A red Herring. Makes Me sick of the petty blaming to avoid real issues. Obama mentioned being in conflict and Justifying that, rather than trying Compromise. At least Clinton Had wisdom in that area.